It was the best trip ever. Really. You know sometimes, canoe adventures can be a mixture of stress and joy – almost always positive but you need to take the bad with the good. This time, it was all good. As usual, we had procrastinated on choosing a location and date, and found ourselves making decisions in late June. Time off is a premium with both our jobs. We would have two weeks to take a trip north of sixty. 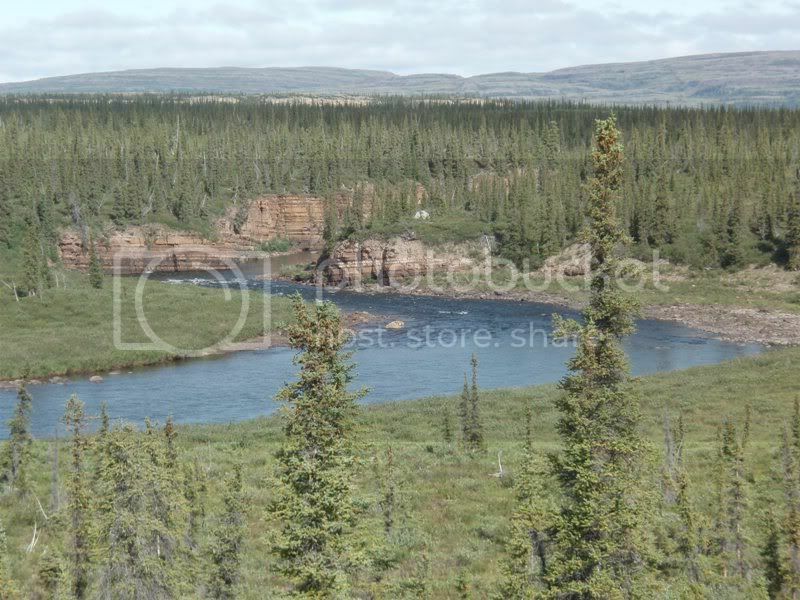 In previous years we’d paddled the lower Coppermine to Kugluktuk, and the Nahanni from Virginia Falls. This year, I wanted to return to the Barrens, at least for part of our trip. After much pondering, we elected to do a trip on the middle part of the Coppermine. Big trips on this river run four to six weeks. We wouldn’t have that kind of time. 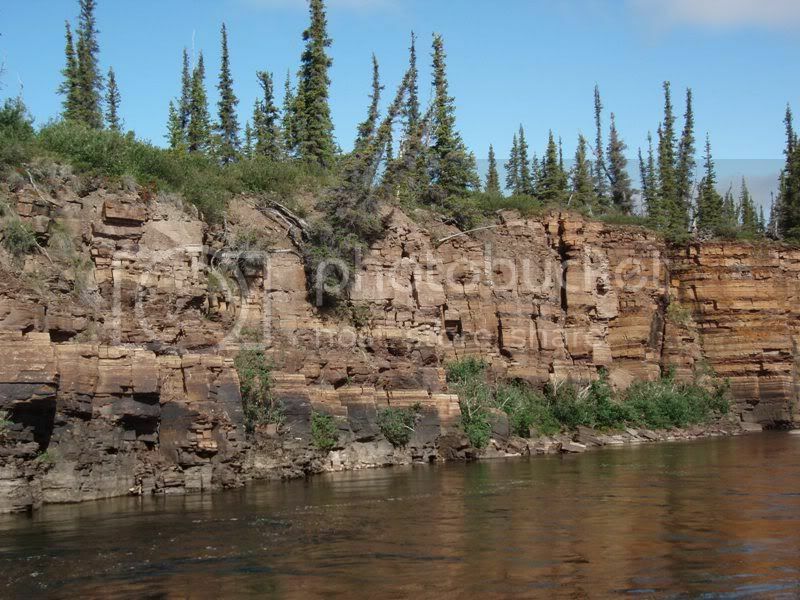 Having done and enjoyed the lower river (Big Bend to Kugluktuk), we chose to try the middle section, from the Hepburn River to the Kendall River, starting just downstream from Rocksnest Lake, and overlapping with our previous route a bit before flying out. If we were ahead of schedule, we had a couple of possible stretch goals, either overland to Kamut Lake via the Hook River Valley or up the Kendall River to Dismal lake. 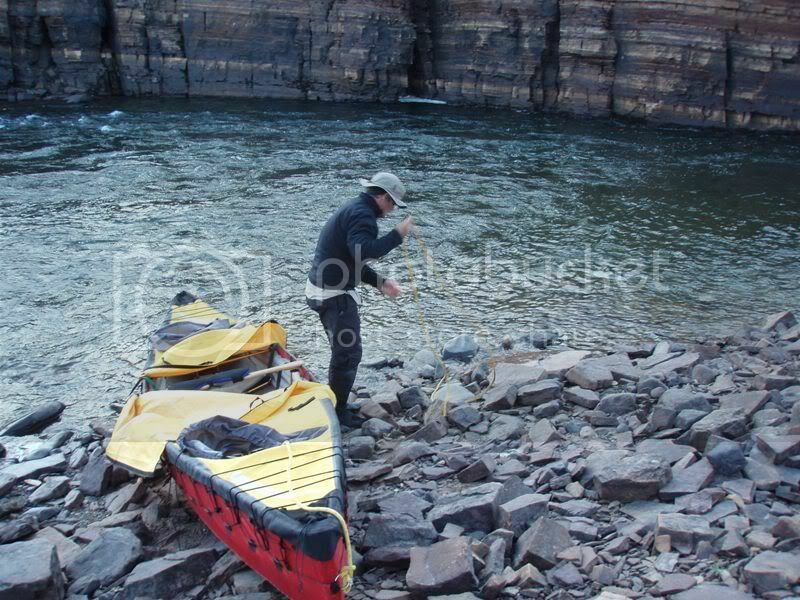 Logistics had nearly killed us the previous year for Nahanni, with UPS losing our Pakcanoe (told us it was “delivered” when it left their dock in Edmonton), and both Canadian North and Firstair leaving bags off airplanes not once but three times. This year, despite my PTSD induced nerves, everything went smoothly. For access to the river, we got help from the folks at Plummers Lodge on Great Bear Lake. Their core business is fishing, but they are well situated to access that chunk of the central arctic, and were very helpful. Canada post got our boat to their base in Yellowknife one day faster than promised, and the boat got to the Lodge on Great Bear a week ahead of us. I started to sleep better. Flying out on Friday July 31, we encountered what I now know are normal issues with firearm and ammunition at Pearson Airport. The regulations are not well understood by the airline staff there (is fine once north of the 49th parallel). But, after some tension checking in, our plane took off on time en route to Edmonton. We were scheduled to stay overnight at one of the airport hotels. We rented a car (all they had left was a convertible, darn), did some last minute shopping and visited a friend who had just moved to town. Next morning, we were off to Yellowknife and then via Firstair Turboprop to the Lodge on Great Bear Lake. We arrived for lunch, checked on our boat, repacked our gear, and had a relaxed dinner and night at the Lodge. 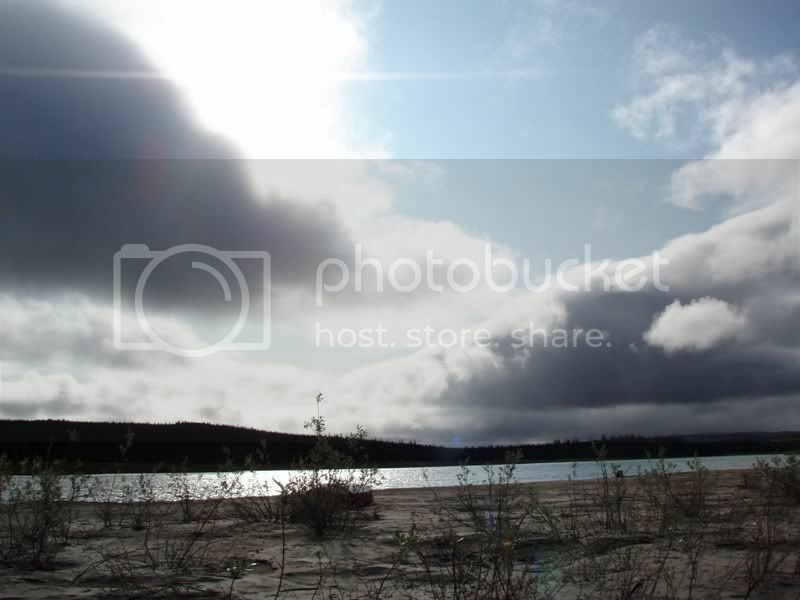 While there, we met another group of paddlers that were starting a more ambitious trip, from the Lodge on the Dease arm of Great Bear Lake, up the Dease River, across the watershed to the Dismal Lakes, down the Kendall River and then down the Coppermine to Kugluktuk. They had three weeks planned. I can’t wait to hear about their trip. Sunday dawned with broken cloud and Shane, the Lodge manager pulled us aside at breakfast to let us know we would fly out first thing. 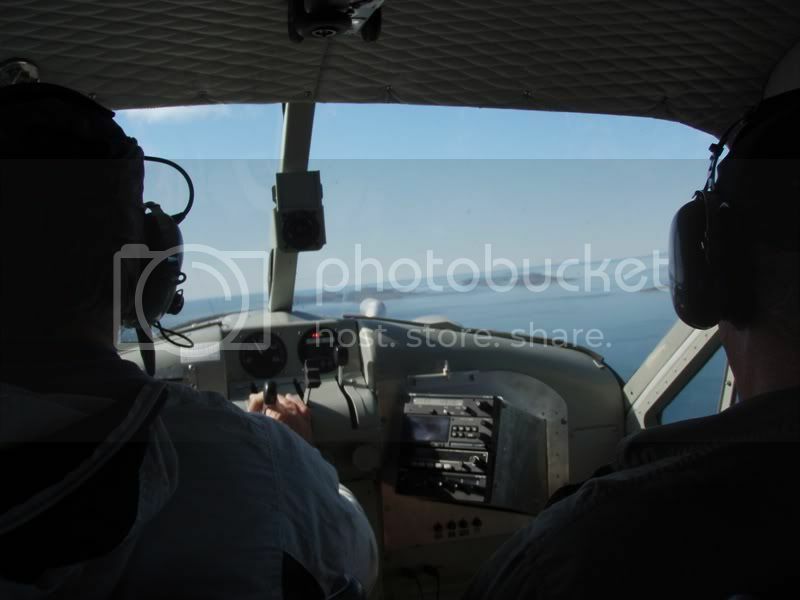 We packed our gear into the Otter and our pilot, “Fast” Eddie taxied us into the bay and smoothly powered us into the sky. Some broken cloud on the mountain tops at the East End of Great Bear had me a little worried, but it remained broken and we arrived at our put-in short order. There is a widening of the river (a small lake at this water level) where the Hepburn River flows into the Coppermine. We circled to find a clear patch of water to land and a beach to disembark. Eddie found us a nice gentle sand back on the West side of the river. We unloaded the airplane, and asked Eddie to wait while I counted the parts of the canoe. I have a deep seated fear of watching the float plane fly off only to discover I have forgotten to pack a crucial part of the canoe. I also get some joy in the raised eyebrows and sometime audible laughter when I dump the contents of the canoe onto the beach with a resounding clank. You can hear their thoughts; “you are going down the river in that?! ?” off. The boat parts were all there. Eddie taxied away and took off. We were on our own. The bugs were moderately bad, but the sun shone and the temperature was mild. We debated getting on the river but decided to ease into the trip. We pitched the tent and assembled the canoe. After a short hike, we prepared dinner and settled in to sleep. In the past, the long daylight of the north has messed with my sleep. But not that night and not for the whole trip. We slept well, and awoke eager to begin our adventure. After getting underway, we passed the Hepburn, the current picked up and some easy rapids started. For this trip and our previous one, we were well educated by Allan Jacobs’ excellent trip report for the Coppermine. There is little information I could add. Allan, we are in your debt. A lone moose browsed on river left. We were to see several more on this stretch of the river. I failed to catch fish. We camped at an Island in front of the White Sandy River. It was a small site but a good one. The next day, we finished the rapids that culminate at Fairy Lake River. Michele and I alternate in the stern and this was my day. It was fun. As stated in Jacobs trip report, the river is broad and shallow. We had to drag the last 300 M to the tributary. A couple of casts produced two nice char. It was well before lunch, so the fish were released. Michele hiked up the valley. It was a good day. We carried on to Valiant Creek, seeing a lone white wolf prowling the bank on river left. The next several days the river flattened out. The fishing was poor, but wildlife was abundant...including a herd of about a dozen caribou, crossing the river in front of us. After Valiant Creek, we camped at a gravelly site by Morceau Creek. The next day (Thurs Aug 5), a fair day turned cold and gloomy with a nasty headwind. 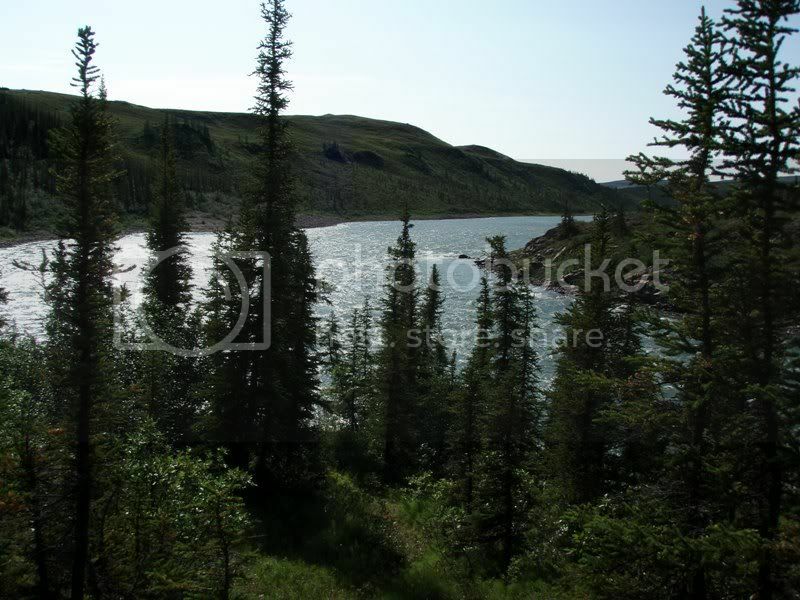 We slogged on for a bit and then pulled onto a sandy beach about sixteen km short of Iceberg creek. We had still made about 22 km. Michele and I are not proud of or terribly worried about our mileage. On flatter water, 20 – 30 km is just fine. For this part of the Coppermine, the current is slow and the valley is broad. In the relatively high water levels we experienced (ice had only come off the land a couple of weeks prior), the river spreads into a broad flood plain, leaving one searching for current to help with progress. Wind can really slow you down. On the positive side of the ledger, the bugs which I would categorize as moderate when we started pretty much faded out. Dry weather and cool nights meant that the season was more or less over. Rain mid trip caused a small mosquito hatch, but our Muskol and bug nets were put away after day three. 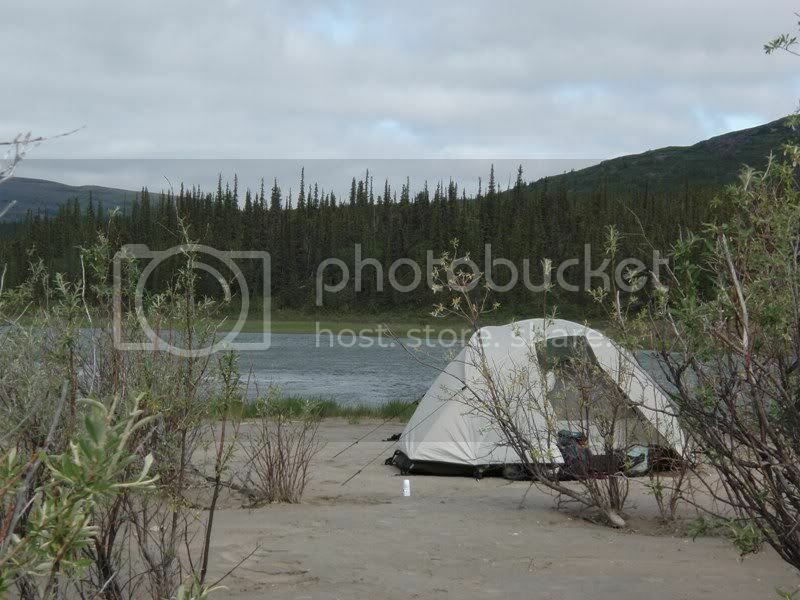 The campsite was on a sliver of beach backed by a tall bank and a bit of a plain on river left. The wind lashed us pretty hard and we contemplated moving the tent up behind the berm. But, we stayed put and all was well. On Friday, we slept late hoping the wind would abate. It moderated, but remained strong from the north. We pressed on and the weather improved as we paddled. At 4:00 PM, we passed the starting point of our trip two years ago, connecting the lines. 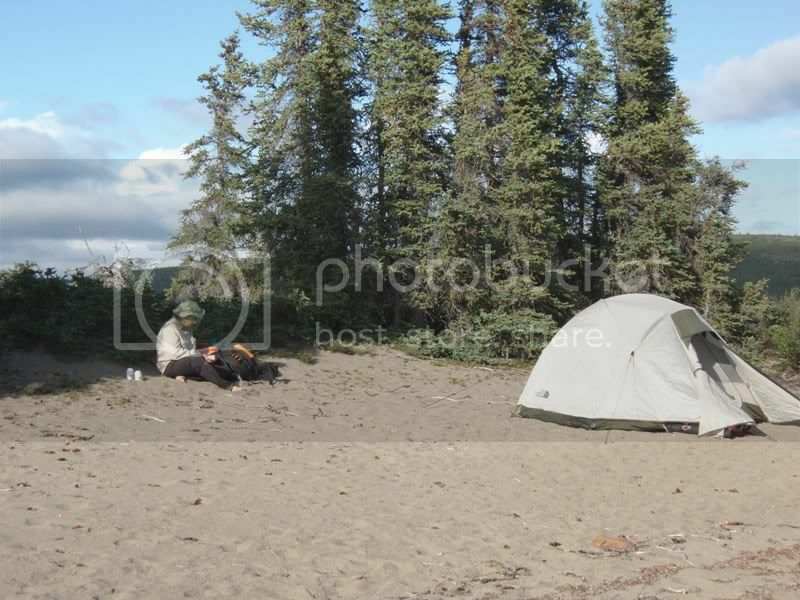 The spot is a lovely sand beach on River Left, but we passed on camping due to fresh grizzly tracks. We continued another hour and camped on a damp sandy Island just south of where the river turns west toward big bend. We later christened this site “Ptarmigan Island” after a flock of about fifteen flew over at 5:00 AM and surrounded our tent. They are plump and pretty, cluck comically, and look very tasty.....we didn’t sample any. 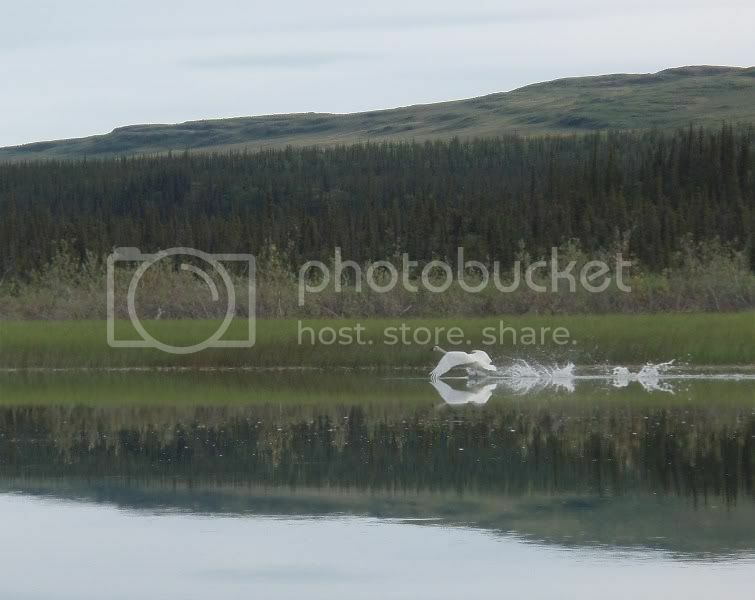 A large muskox later splashed along the shore across from our site. The weather turned cold. A strong north wind lashed the tent. Dark clouds boiled over the northern hills and delivered rain mixed with snow. We decided to sit tight for a rest day. Our Island was short on firewood but our twig stove is remarkably efficient, and we had no trouble cooking and making morning coffee. On the second evening, after the weather had moderated, two boats approached and we met four Danes who had been on the river a month, starting at Winter Lake. They still had three weeks to go and were shooting footage for a Danish fishing show. We exchanged fishing spots and talked about our boats (they too were paddling Pakcanoes). We were to play leapfrog with them for the rest of the trip. We saw no other people in our eleven days on the river. The next day dawned clear and still. We felt strong after our rest day. In a dead calm, we paddled north then west towards Big Bend. 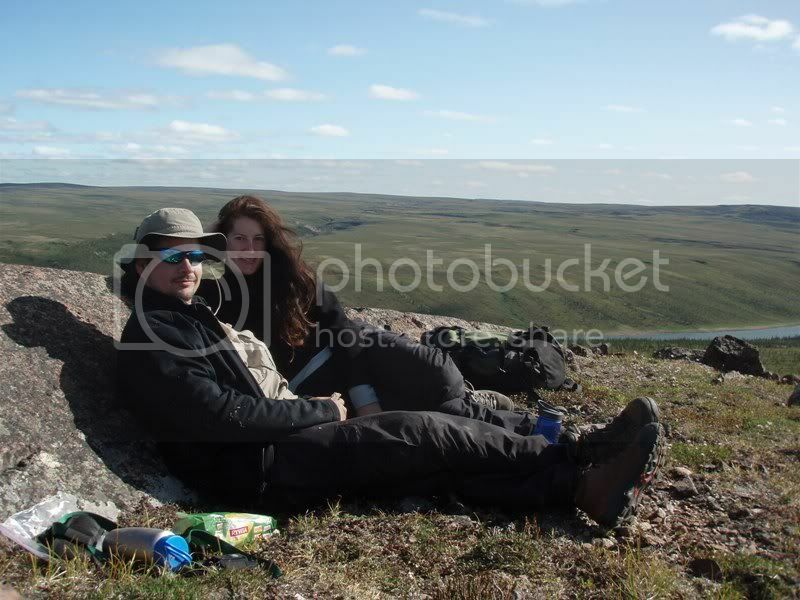 On the way, we saw swans , caribou and a herd of muskox in the distance. 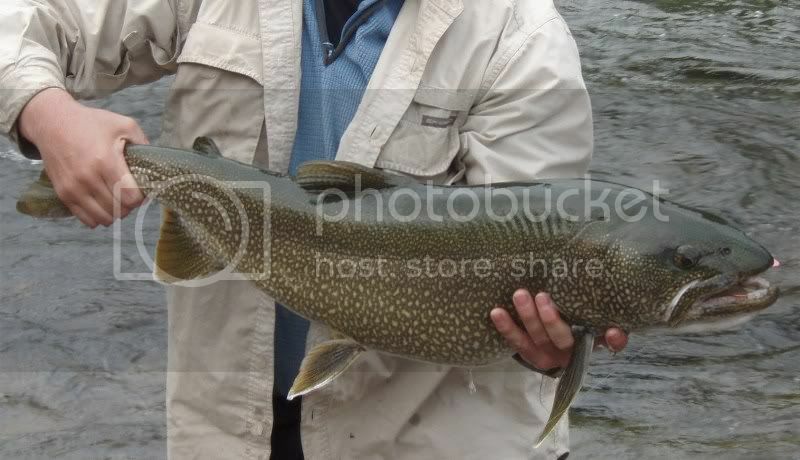 We stopped to fish at Big Bend and the Hook River with no luck (other than a lost lake trout). After a fun little C1/2 rapid, we arrived where the river splits around a large Island at Nunavut Creek. Here we caught a nice char which we kept for dinner, and camped on the south tip of the island. It is a glorious spot with nice breeze and a panorama of hills across the river. While rocky near the water, we managed to find a soft and flatish spot up the bank. We ate the char three ways; sashimi with soy and wasabi, foil baked with Thai curry, and foil baked with salt, pepper and garlic. All were good but we especially liked the sashimi and the simple bake. Mmmm. We lingered the next morning, taking in the scenery and came to regret that. Calm turned to gentle north breeze which kept building to a gale from the north. This, combined with 10 KM/hr of southbound current made it feel like we were paddling in a wind tunnel. What should have been an easy float to Rocky Defile turned into a bit of a slog. Making progress was ok with the current, but it was a fight to keep the boat under control. We passed the Danes we had met earlier in the trip. They were just breaking camp at the confluence of Big Tree River. On the wildlife front, a herd of five or six muskox at the shore on river right spooked when we came around the bend and surprised them. Mid Day, we came to Rocky Defile. We had paddled it on our first trip down the lower Coppermine. This time though, the water was higher, and what felt like a 40 Km/h wind was funnelling up the river, kicking the waves up even higher. We’d been fighting the boat (and the wind) for a couple of hours and just didn’t feel like it. So, we walked. In no hurry, we double carried and had lunch at the end of the port. Starting the second carry, the wind had moderated, making the rapid look a little less intimidating. Still, no regrets. It felt like the right decision at the time. It did, however, take a lot out of us. We paddled the remaining seven km to Kendall River still thinking we might paddle up the Kendall to the Dismal Lakes. It was Monday. Our Pickup was Thursday (and could be pushed to Friday if required....the miracle of satellite phones). We got to Kendall, rested a bit, and started upriver to gauge the current and water levels. I think we got about a KM. The Kendall is a lovely, fast, and sometimes shallow river. It empties into the Coppermine in a beautiful stone gorge with a couple of small rapids. We paddled till we couldn’t anymore, and then starting tracking the boat. The effort of the Rocky Defile carry weighed on us. We were also worried about the boat. We quite like our Pakcanoe. It simplifies logistics (particularly for just the two of us), has proven tough, and is very stable in big water like the Coppermine. 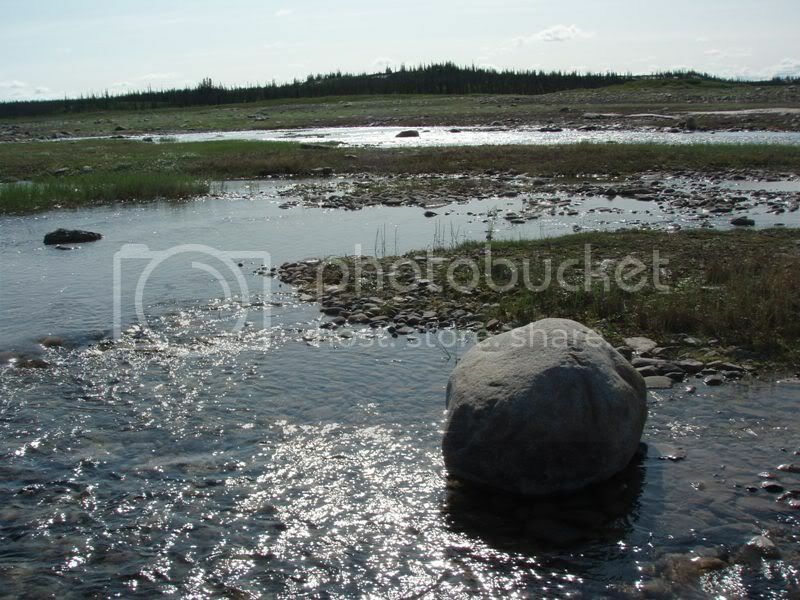 However, I worry about dragging it over rocks as one might do tracking up a shallow river. The Danes we met had suffered three punctures in their two Pakboats doing some serious tracking/lining earlier in their trip. So, with this for an excuse, we decided to shelve the stretch goal of Dismal Lakes and settle in. We were stopped in the aforementioned gorge, just shy of where the Kendall Valley opens up. The beach was made of shattered limestone. It was a twenty foot cliff up the bank. But, we found a spot where we could scramble up and set up on a lumpy but otherwise well protected site in the trees on the high bank. We would stay here for two days. 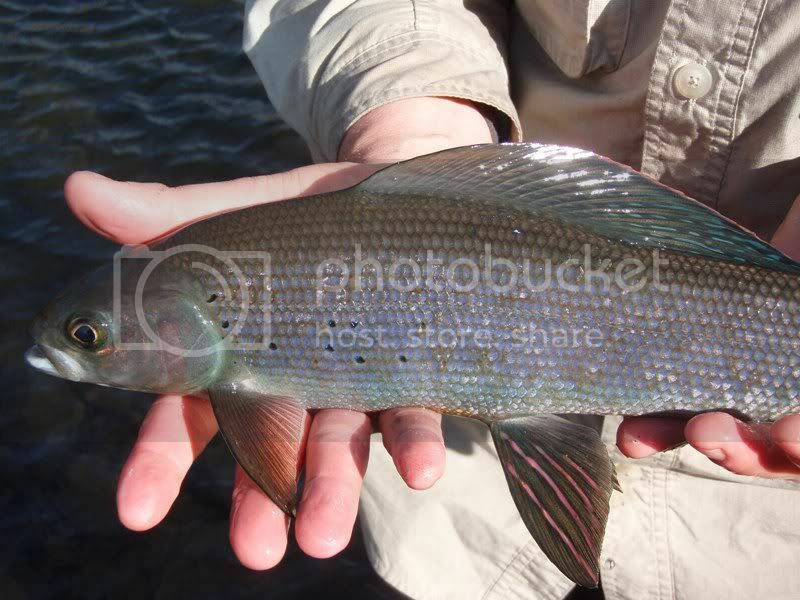 Because of the good fishing in the pool below camp we dubbed this “Camp Grayling”. 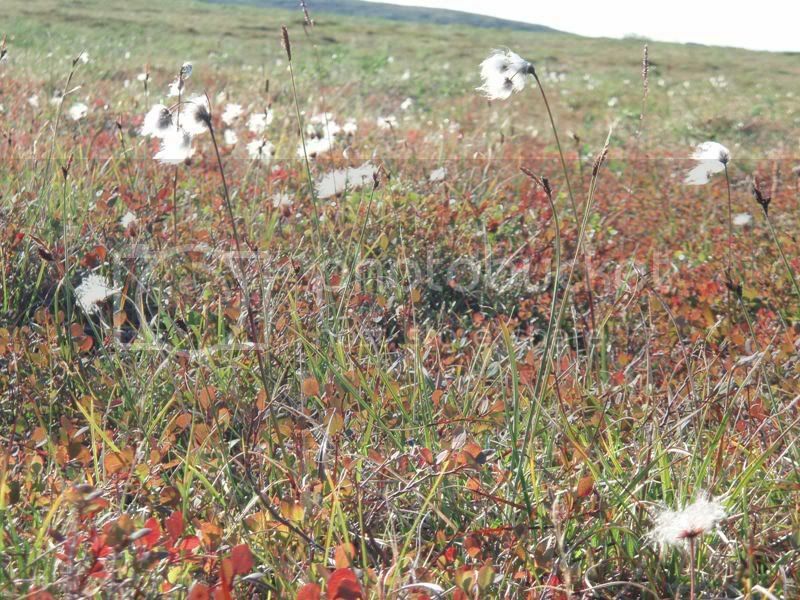 The next day, to make use of our time and energy, we hiked south out into the barrens proper and climbed the first peak south of Kendall on the west side of the Coppermine. It was maybe five or six km one way, and took us about six hours round trip. The barrens are captivating. One has such a sense of space, and distance is very hard to eyeball. From the top of the mountain, we had a panoramic view, north to the Palisades and September mountains, east and west into the barrens, and north to Rocky Defile and the river valley. 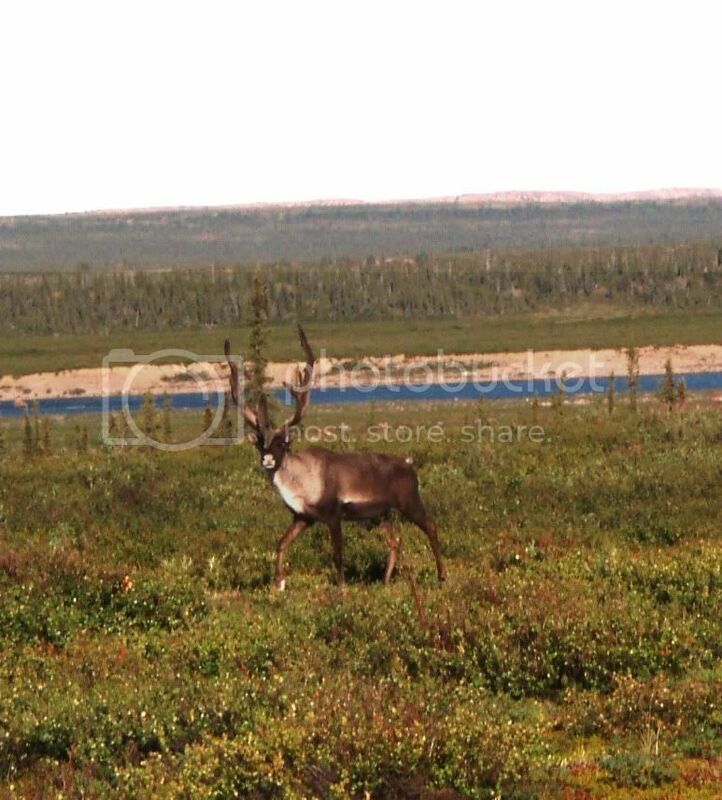 On the way back, we came across a lone bull Caribou. He was an impressive beast, with huge antlers and bulging muscles. Right now, I suspect he’s out looking for trouble, getting ready for the rut. His curiosity had him approach us to within about 30 m.
We were exhausted when we got back to camp, and cooked a large meal of pasta with mushroom gravy, fresh onion, dried tomato, and dry salami (landjaeger). The next day, we were beat. 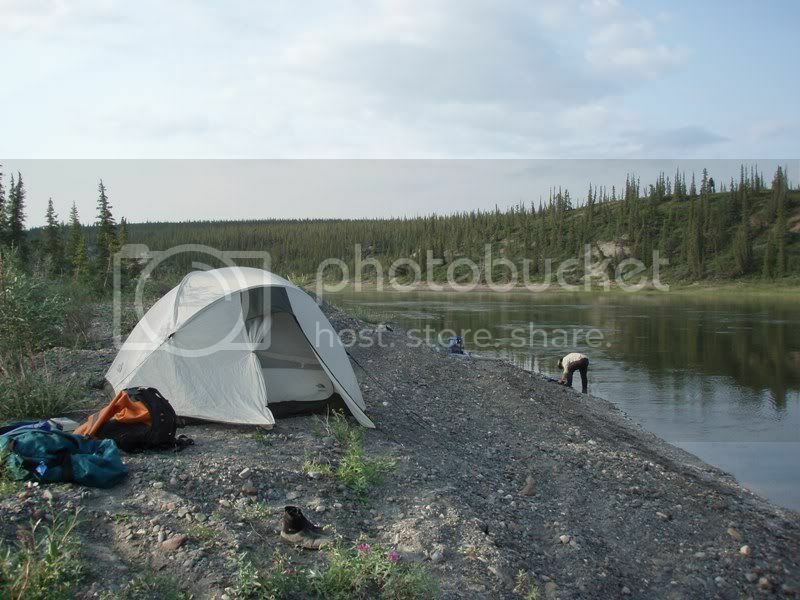 We hung around camp, fished, I took a short walk up the Kendall, and then, in the afternoon, we packed up camp and headed to our last site on the south side of the Kendall where it intersects the Coppermine. We had a million dollar view as we settled in to wait for our flight out the next day. The next morning dawned...foggy. It was soup with maybe ten M of visibility. I contemplated using the Sat phone to call the lodge and let them know. However, within an hour the fog burned off and we had another brilliant, sunny day. The pilot buzzed our tent before landing to get us moving. We packed and flew back to the lodge for a hot shower, soft bed, cold beer, and some time to sort our gear prior to the slog back to civilization. All too soon it was time to catch the turboprop back to Yellowknife. Weather and mechanical issues for Firstair in Edmonton had backed the schedule up a couple of hours. This was not a problem for us since we had already planned to spend the night in Yellowknife. However, a number of lodge guests had an anxious time trying to reschedule connections. I think this is a good lesson – not a good idea to plan tight connections when travelling in the North. Yellowknife was pleasant. I have always enjoyed walking around old town, looking at the houseboats and floatplanes, and dining in the funky restaurants. 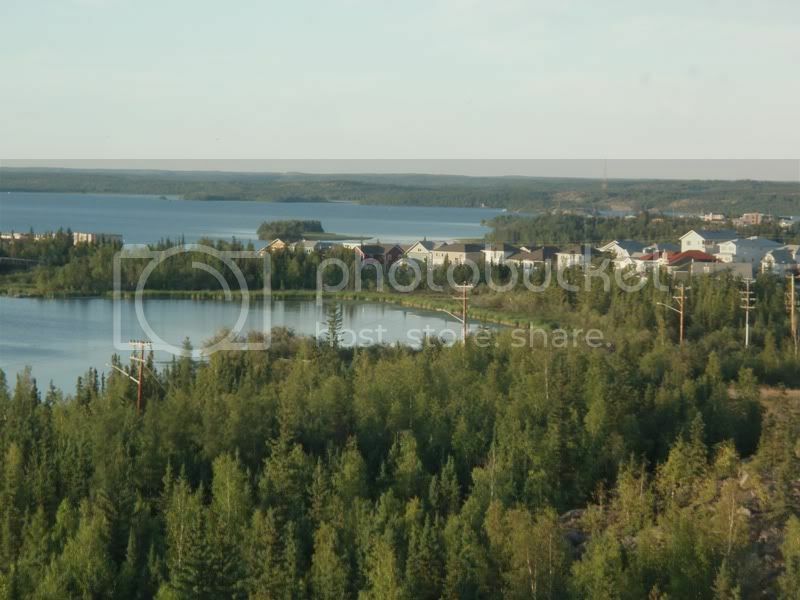 I’ve only been in Yellowknife in the summer and it feels as alive as anyplace I’ve ever been. This trip we dined in at the Wildcat Cafe, enjoying a bison burger and pan fried whitefish. The next day, we were up early to catch our flight to Edmonton, and from there Toronto. This all went off without drama. By early evening, we were home and feeling hot, sticky, crowded, and out of place. It will take a while to re-adjust. Parting thoughts. As I said earlier, this was a fantastic trip. The weather was more or less perfect, logistics were flawless, and our schedule was relaxed enough that we were able to enjoy the scenery and really “chill”. 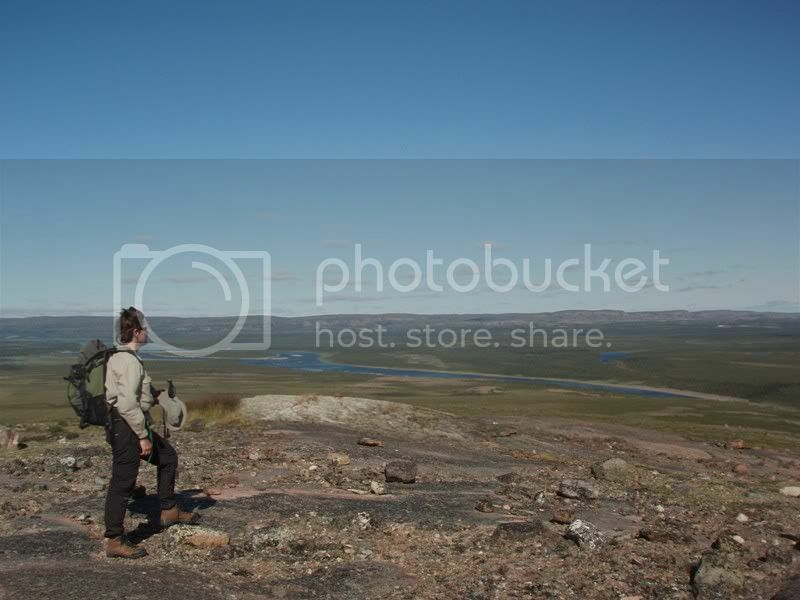 The Coppermine is an amazing river and the central arctic is beautiful. We love the light and the air. It is expensive, but I think everyone should try to get to that area at some point. There are some many other beautiful places to visit, but I will have a hard time resisting a return some day. Special thanks to the folks at Plummers; Lodge for the logistics help and once again to Alan Jacobs for his awesome trip reports. Finally, thanks to Michele, the best partner in paddling and life of which one could ever dream. -We loved our North Face Moraine 33 tent. It is spacious, reasonably light, a nice neutral colour, and, despite being 3 season, has a 3 pole design and withstood the two days strong wind, rain ,and snow that we faced. -A Pakcanoe 17 is not as fast as a hard boat, is not as tough as Royalex, and doesn’t turn as well as a dedicated white-water boat or even a Prospector. But, it is plenty tough, swallows gear, turns well enough for tripping, and, with the spray deck, absolutely eats big waves. Mailing it is a snap and it really opens up the options for airplanes/small groups. -Sleeping bags. We had warm days and cool nights (down to about 2 – 5 degrees). Michele used an MEC Raven -12 bag and I had an MEC Drake (probably 0 degree) with an additional liner. We were both fine. -Cooking: we don’t take a fuel stove on these kinds of trips. The airlines make it such a hassle and fuel is heavy. We either cook on open fires (easy on all but the last 100 KM of the Coppermine) or use our Bushbuddy twig stove, which works well even with willow and alder twigs. -Cookware: on these trips, we bring an old GSI stainless steel pot with a fry pan lid (only every used as a lid) and a GSI no stick fry pan with a folding handle. The pot has a bail making it useful for cooking over fire and we find the no stick pan is a huge improvement over the stainless lid/pan that comes with most cook sets. On future trips we may be tempted to bring one large hard plastic food container for leftovers. Normally, we keep them in the pot but this complicates coffee the next morning. -Food: we bring too much, every time. But, is comforting to know we won’t go hungry. We bring some freeze dried meals as emergency rations but mainly focus on dry pastas, lentils, rice, couscous (good because it is fast) with assortments of sauces . For protein we bring a few blocks of fresh cheese (our Edam on this trip lasted particularly well), Mennonite dry sausage (landjaeger), foil tuna and some soy protein. This is supplemented with fish. -Bear stuff. 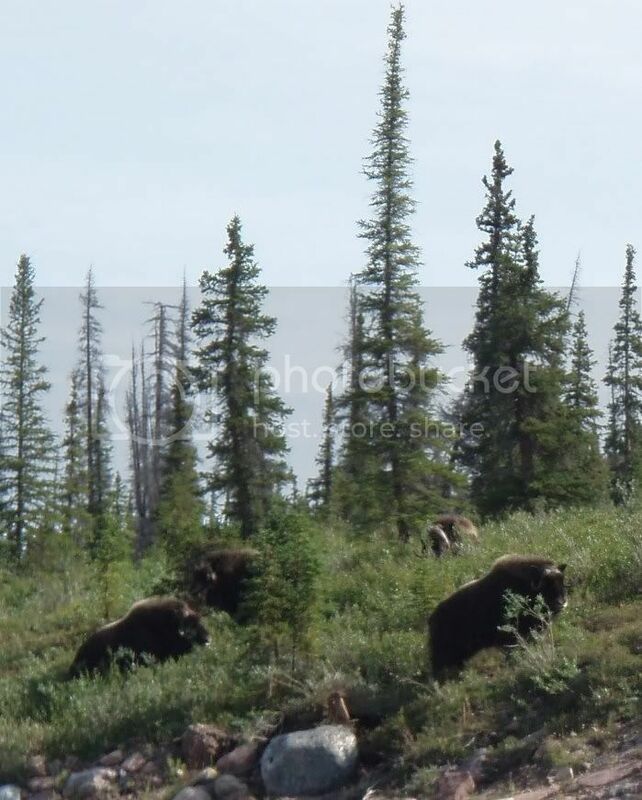 In Barrens Grizzly country we carry a 12 gauge Remington 870 shotgun and bear spray, and have yet to use either. We also set up four battery operated motion alarms around the tent when we sleep. These seem to work very well (although not tested with a bear yet) and help us sleep at night (except when a flock of ptarmigan set them off at 5:00 in the morning). 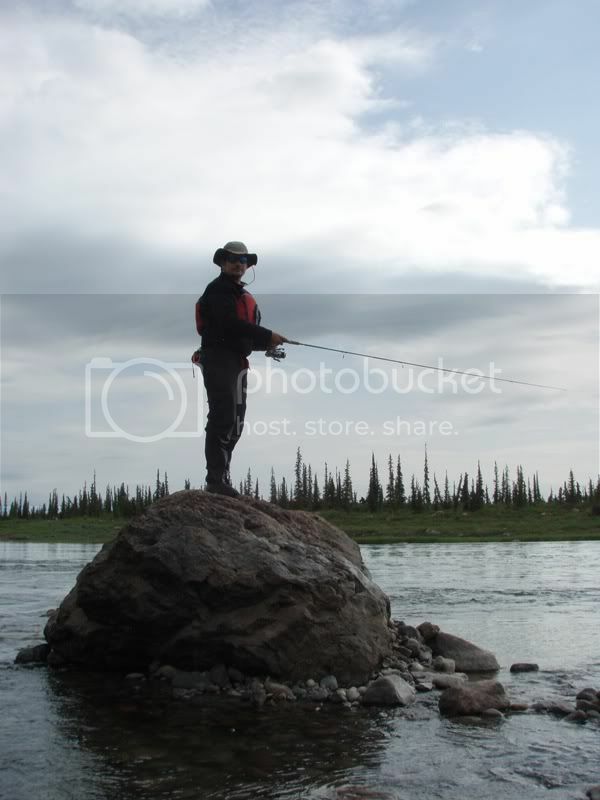 -Fishing gear. I took two shimano pack rods and two reels. One a medium heavy outfit with 30 lb braid for char and the other a light outfit with 6 lb test for grayling and small trout. Continuing a tradition I snapped the tip of the heavy outfit trying to pull it from under the spray deck but it remained functional. I used four lures all trip. For char a rocket devil and a pixie spoon and I could have used just one of those. For grayling a Mepps 3 spinner and a Little Cleo. 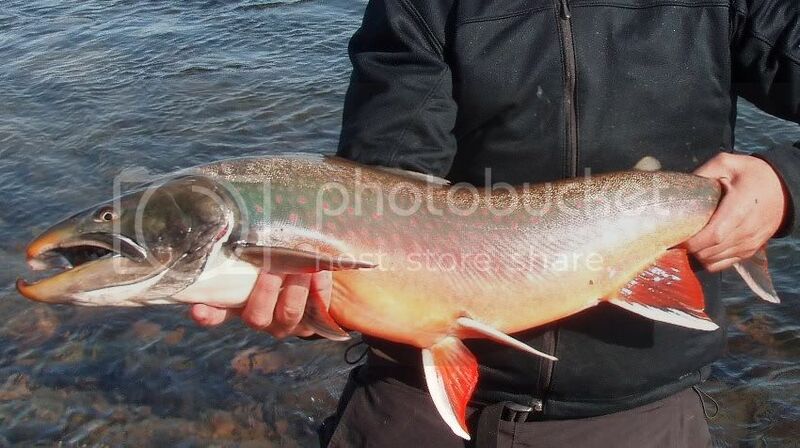 Catching fish on the Coppermine is more about figuring out where they are than anything else. -- Food barrel – packed tight with careful planning on density (making it lower...put the nalgenes in it) to get to < 50 LBS weight for our airline friends. Note, the barrel, no matter how full, will expel air through the seal as the aircraft gains altitude and will then cave in a bit at normal altitude. Ours has gone through this cycle six times and has not noticeably suffered. We do duct tape the lock ring to prevent the catch snagging on a baggage conveyor. -- When we get ready to hit the river, the personal bags have most of our individual clothing, the camping gear, sleep clothes and emergency warm clothes are packed in a 115 L SeaLine dry bag. Food and cookware go in the barrel. In past, we used a second dry bag but this trip we took one of the duffels and carried the overflow in there – things that could get wet lose and other items in some of those new, fancy, lightweight dry bags. This worked find and saved some bulk for flying. But, no swims so we don’t know how well they would fair in a capsize. *Island site at mouth of White Sandy River (river right). 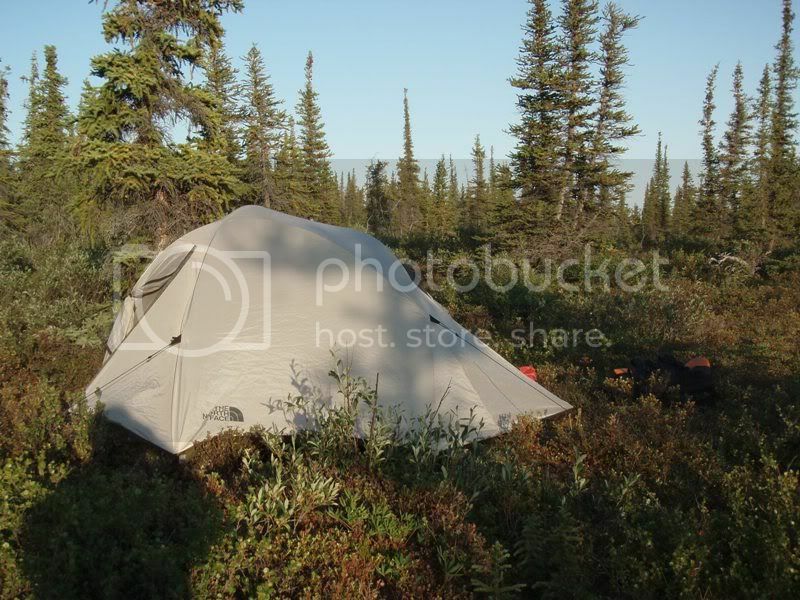 Small, rocky/ lumpy, but still nice for one tent. Probably not good earlier in season because of tern nests. 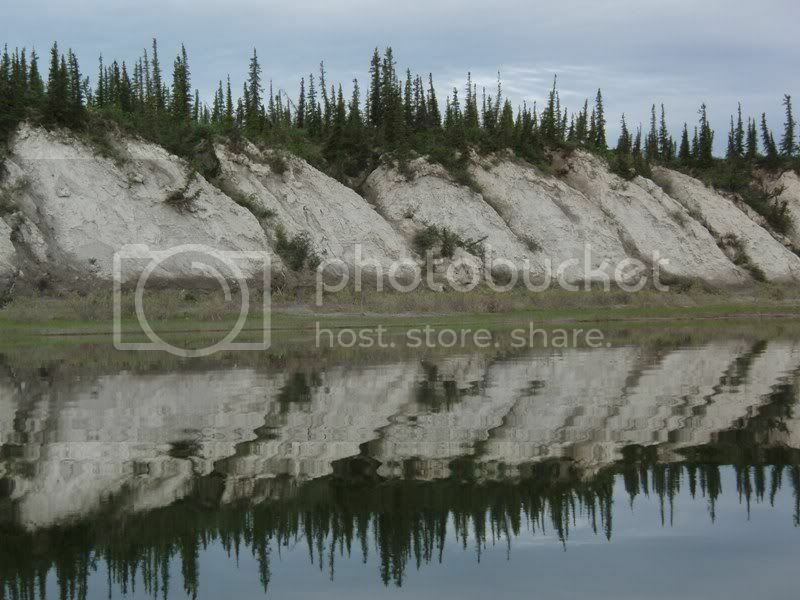 *Sandy site on river left on north bank of Morceau Creek. Room for a few tents. Likely not a good site at higher water. *Approximate (+/- 2km) River left, narrow beach just passed the 2 cabins on river right. Location Narrow beach, long..lots of room, More room over bank in meadow. *Island site just before river turns west to Big Bend. Flat. Soft. Just a bit damp (water levels had just fallen). Large site for these water levels and lower. Useless in higher water, Very little firewood. 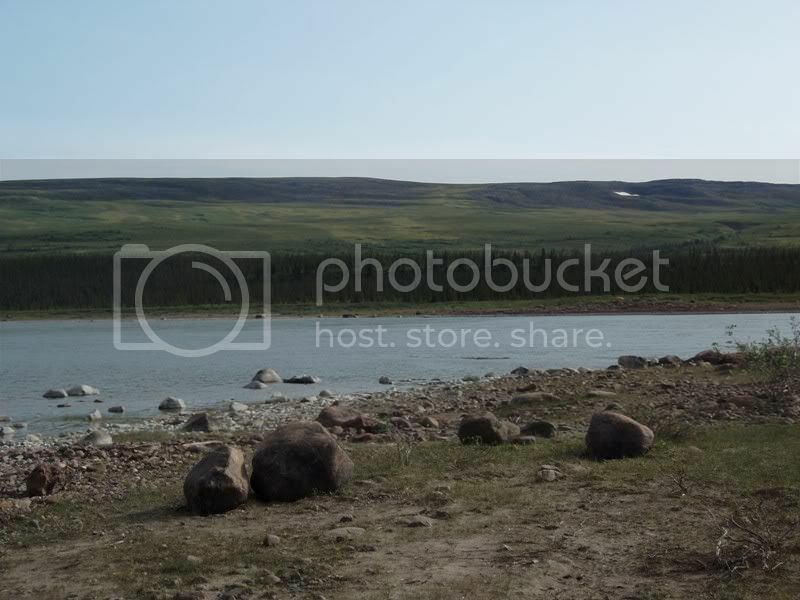 *North shore of large Island by Nunavut creek. Rocky/boulder but some soft spots higher on the bank. Lots of room if willing to spread out. Great views. Good breeze. *South side of Kendal at Coppermine. Nice flat spot on bank with good views and breeze. Is more room but sharing site with remains of fish camp. What a great read for a Saturday afternoon. Going to make me dream of my arctic trip for the rest of the weekend. Excellent report and photos - and interesting logistics too. 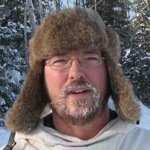 Do you think shuttling paddlers - both from Yellowknife to Great Bear and from the lodge out - is something that Plummers is interested in as a regular business, or were you just a "one-off" because the planes were not full of fishermen? JMC - While I dont think they'll start bumping anglers off the charter, I think (would need to confirm) Plummers would be more than happy to fly Canoeists in and out of the area around Bear. They have a couple of Esquif Prospecters and a couple of Catarafts available at the lodge. Else, the packcanoe solution works well. I can put you in touch with the folks there if you would like. The bucket list just got organized! Any thoughts on the whitewater as compared to the Seal River? if anyone knows, that would be great! Do you have cost information on the flights to and from Yellowknife that you could share? PM me, I am in the planning stages for this. 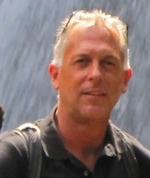 Under the conditions we had, I would rate the whitewater on the two as comparable. We had very low water on the Coppermine and high water (nowhere near as high as you had though) on the Seal. On the Coppermine (again, in low water) we portaged stuff that we would ordinarily have run; we were spooked though by a pin and a wrap farther upstream and decided that our crew was not up to the challenge. Some of the stuff we ran on the Coppermine, especially the stretch above Escape, would be a horror in very high water. Bill Layman and Lynda Holland ran the Coppermine with water in the trees. I would have turned back as soon as I saw that. Our trip was in 2002 and prices will have changed major-league since then so there's no point in my searching my files. Please deal with a reputable outfitter. Cant comment about the Seal because I havent done it. On our first trip down the Coppermine in 07, I think we had water levels similar to what Allan encountered. I concur with him that the day leading up to Escape rapids is the risky bit since it pretty much continuous and has to be scouted from the boat. I do wonder if parts of that stretch might get easier in higher water due to wash out rather than harder. Would love to hear from someone who has seen both. The named rapids can all be carried/scouted from shore so are not such a big problem. 1 Extra Large Snowboard bag use for paddles and other long items (shotgun case, yolk). As for the comparison of coppermine to seal, there are similarities and differences. I think the biggest difference would be tundra river and taiga (?) river. I'm not sure if taiga is the right term for the seal. Some boreal forest, some Hudson Bay Lowlands. I ran the Coppermine from Point Lake to the Kendall in 2002 and it was challenging, more so than I wanted. It was worth it because I lined up the Kendall, paddled along the Dismal Lakes, portaged to Sand Creek and went down the Dease River. I flew out from Plummers on their DC3. The canyon at the bottom of the Kendall can be avoided by an easy portage from the slough nearby. I cought three fish in the Dismal Lakes. Weather was hot and bugs were many. I paddled a Sawyer Loon. Saw migrating caribou on the long portage to Sand Creek. Saw no bears but in one of the plywood shacks on the Coppermine (where everybody scrawled their names with felt tip pens) there were claw marks at ceiling height (7 feet) and the marks were 1-1/4 inch apart. The bear had gone on one side of the shack and out the other. Formerly Plummers had a piston Otter and it gave them a lot of trouble. I remember seeing the plane in pieces and the replacement engine being unloaded on the airstrip. 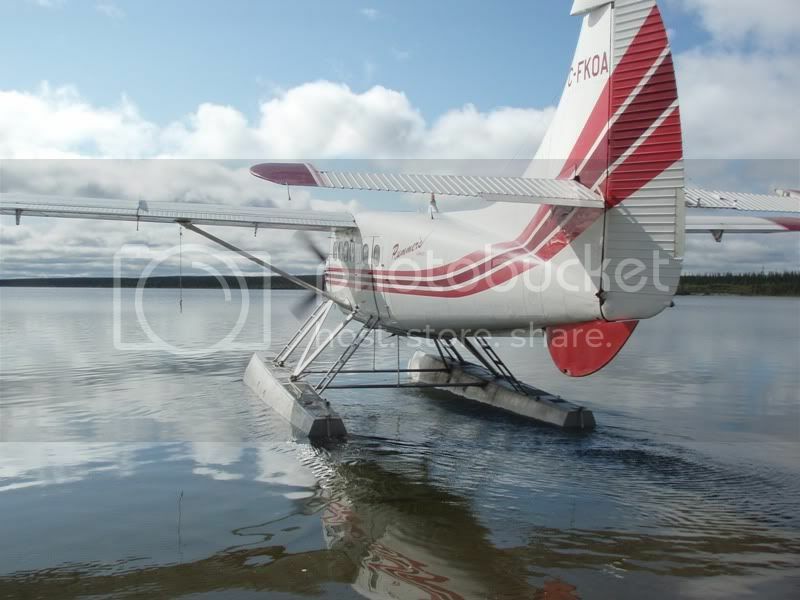 Last year Shane related that "we traded the DC3 in for turbo otters on floats". Riding the DC3 back to Yellowknife was a good deal while it lasted. I did it three times. There was plenty of room for me and the boat. Cool trip! May I ask how long it took you up the Kendall and over the height of land into the Dease? "... May I ask how long it took you up the Kendall and over the height of land into the Dease?" 21 July Started up the Kendall. Lots of easy lining and dragging. 24 July Arrived east end of Dismal Lakes. 27 July Arrived west end of Dismal Lakes. Easy paddling in good weather. 28 July Began portage to Sand Creek. Windy cold weather slowed travel. Otherwise, nice country. 1 August Arrived Sand Creek, maybe 12 feet wide. Easy paddling for a while. 2 August Creek now running over rocks. Did a 1 mile portage along creek. 3 August Back to easy paddling over sand. Entered the Dease. 6 August Short portage around rapid. Went down the last stretch of moving water on the Dease. 8 August Arrived Plummers Lodge. Ate a lot. 9 August Flew out on the DC3. I canoe to spend time, not make time. 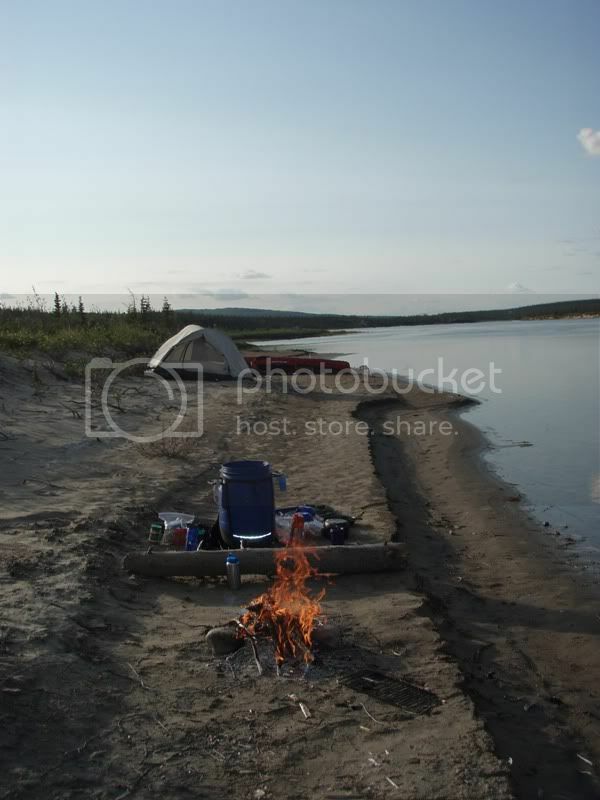 When the wind blew on the long portage I decided trying to carry my boat was not a good idea and rested. Other folks will probably go faster.